I've just returned from a relief trip with a couple others members from our church plant in Kawasaki. I've written elsewhere on this blog about the coastal village of Taro and its great seawall broken and humbled on 311. It generates much emotion to visit an area so obviously devastated by the loss of so much. It will be many years before this place comes back. It's a 12 hour drive to Taro from Kawasaki, farther than an international flight from Tokyo to Chicago (and not any easier on the legs and back). The trip had a few unexpected "slips" and "turns" as we ran into a late-winter snowstorm near the coast. Japan generally does not do a lot of plowing, and no salting. So, the mountain roads were quite an adventure to navigate with "normal" tires. 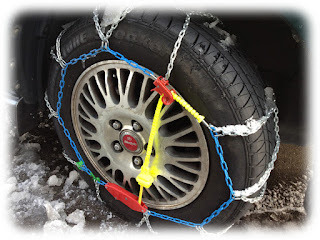 Fortunately, I had tire chains along. Unfortunately I had never had occasion to practice putting them on. 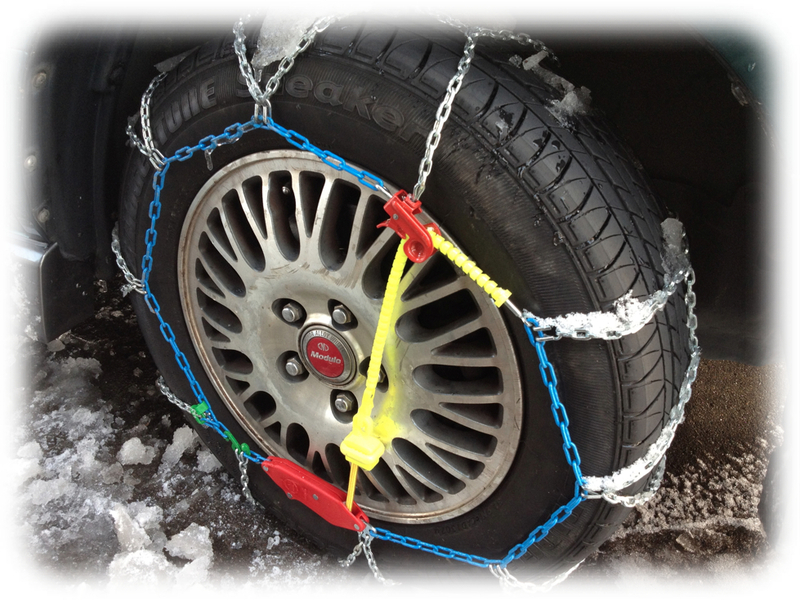 The chains claimed to be "NO-PROBLEM-30-seconds-EZ-on-and-off chains." I can tell you, in the cold, dark and snow, it was nowhere near EZ. I finally gave up and crawled slowly, slipping and sliding, to the gas station for help. It took them 30 minutes. This trip was to a different demographic of people. The survivors who lost their homes in the tsunami have either moved out of the area, rebuilt elsewhere, or are living in temporary housing units. 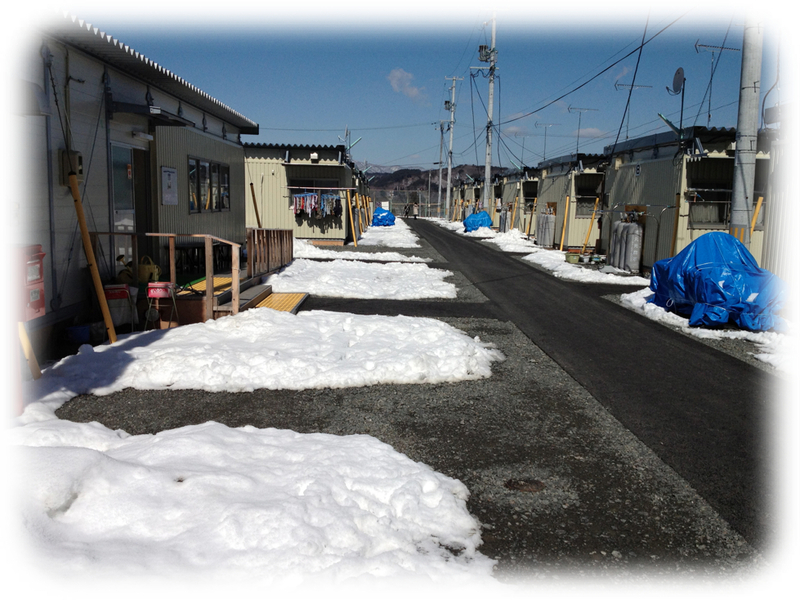 There are several such temporary housing villages within a short distance of Miyako/Taro. During our time in Taro we visited two of these. Nearly 1000 people were clustered together in each village in what resembles army barracks. Space is tight and living is cramped and uncomfortable. We cooperated again with a local church to do some simple survivor care with these residents. 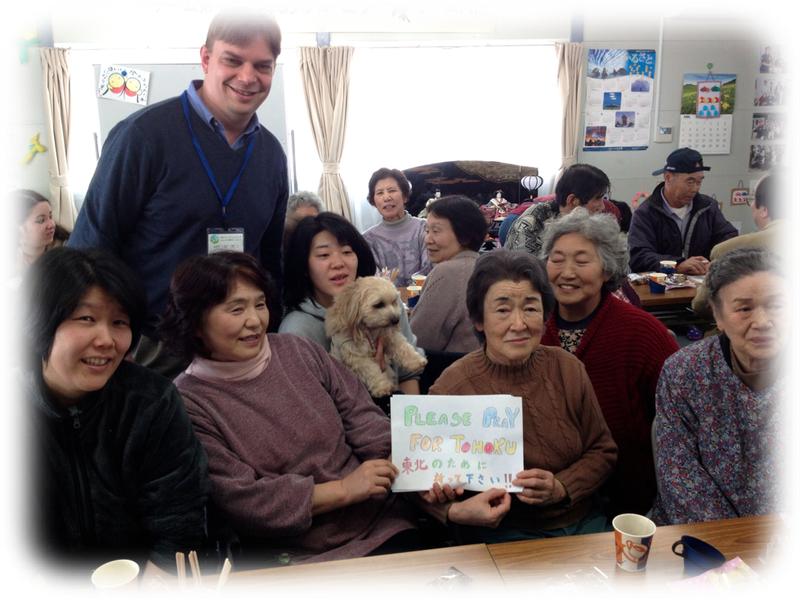 We hosted "mobile cafes" to encourage gathering and sharing with one another. When we arrived in the villages, half the team went to set up the cafe, the other half knocked door-to-door and spread the word that the cafe would open soon. I could tell by the surprised look on some of the residents faces that they had not encountered a big-nose American recently, much less one that spoke Japanese at them. I'm not sure whether this generated more curiosity in the cafe...or more fear. We used a common room with rows of tables for our cafe. Off to one side, a table of Christian resources was set up. People looked through and took Christian literature as they pleased. Although we brewed some great coffee, these cafes were hardly quiet coffeehouse experiences. They were times of loud interaction as residents had a chance to share freely and process the events with relief workers. Restoring the social fabric of connectedness that was torn by the tsunami is probably the most difficult part of the recovery, but the most needed. One participant of such a cafe said to me, “If we didn’t have this cafe, I don’t think we’d be able to put up with this place (temporary housing communities)...I think I’d lose the fight with loneliness.” I had a particularly interesting discussion with one resident which I will share in a later post. Unemployment in the tsunami areas is a real problem. Residents try to do their best with a little bit of government assistance and help from family. It will take a long time for the economy to come back. I noted, however, that the town now had a new gas station and convenience store to give people some options for essential things. Ironically, new vending machines were also in place alongside the otherwise barren area next to the sea wall. I suppose a can of hot coffee in the cold winter months is indeed a kind of emotional relief needed. Without work, residents look for things to keep them busy. One resident shared her newly-acquired talent of basket-weaving. It seems this is a very therapeutic hobby. 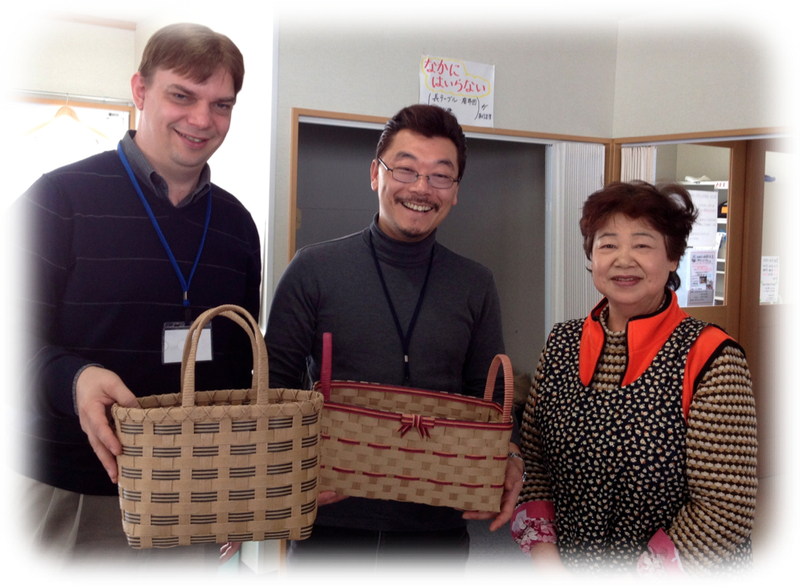 Her bags and baskets were so well made that we strongly encouraged her to consider selling some. We told her that many people would love to buy a well-made eco-bag for shopping in a desire to support the Tohoku recovery. Of course, true to rural Japanese form, she was very self-deprecating and resisted our praise. We did manage to get her to pose for a photo, though. I have the sense that God is doing great things in this town and will build His church here in the years to come. The mission potential of historically tough towns like Taro has seen a reboot with the tsunami. Closed networks have cracked open. New networks are being created. A new spiritual openness exists. Community is being reborn. And in that newly forming community, the church will find an opening for its message. Jesus said, "By this all men will know that you are my disciples, if you love one another" (John 13:35). Taro can't deny that it is being gently loved by God's people. 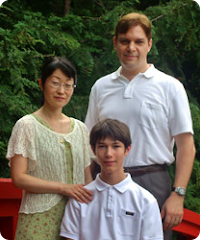 In this Christlike love, the church will put down roots in the "swampy soil" of Japan. 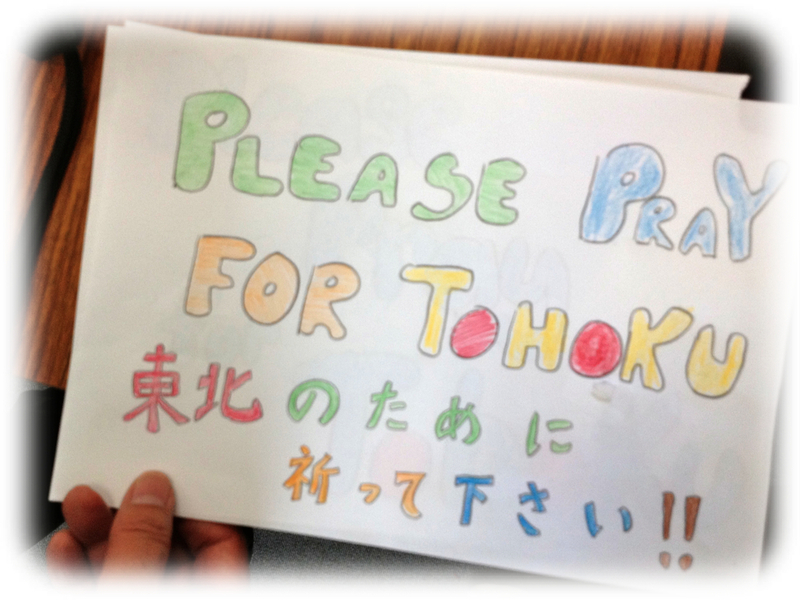 Toward this end, would you continue to keep Taro and the Miyako area in your prayer?